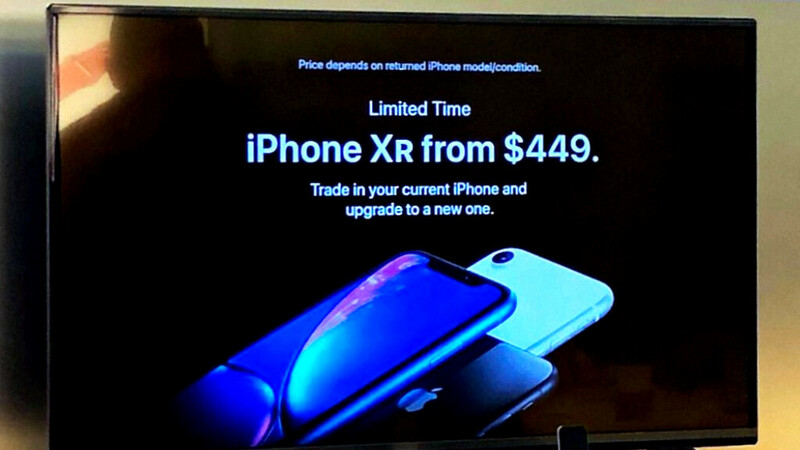 Apple's "trade-in" marketing that advertises an iPhone XR starting at just $449 has now found its way in Apple Stores as well, after being prominently featured in an ad banner on its website, and as push notifications, promo emails and even a short editorial in the Apple Store app. In essence, this is the same GiveBack deal that Apple announced on the hush-hush after the Black Friday and Cyber Monday brouhaha to keep the sales momentum going, just advertised to the nine. Heck, Apple just gave away XRs to everyone in Ellen's audience last week for a good measure. In fact, when you enter an Apple Store now you will be greeted by all of its store displays, down to the Apple TV sets, taken over by that same ad that prompts you to buy an XR at $449, or an iPhone XS at $699. Heavy trade-in discount advertising is nothing special or out of the ordinary as a marketing trick. It's just very new and uncharted territory for Apple in recent memory. For a little company, try a little Group FaceTime on iPhone. And for a limited time, get an iPhone XR from $449 or iPhone XS from $699 when you trade in your iPhone. Price depends on returned iPhone model/condition. Only at Apple. — Apple (@Apple) 7 декември 2018 г. Excuse me, could you tell me which phone is Apple selling with a 720p screen at 1000$? $750 is US only. outside US, iPhones are significantly more expensive. alright man, it's 800p-ish screen. $1000 for 800p screen is so overpriced. back to the original comment, even $300 phones come with 1080p screen now, heck even below $300 there are phones with 1080p screen. so what?https://www.youtube.com/watch?v=dcFXEXJicgc You want crappy screen which sounds good on paper than actually great screen which looks great in real life? yes well this isn't any difference when you android fans years ago played laggy low frame games with your superior 8 core phones ;) while we iOS users had that amazing super smooth performance with 2 cores. When you android fans stop being brainwashed by paper specs? listen part 5.30 very very carefully, it's meant for you. i'm not saying those $300 phones are better, OP6T for example has massively better screen and phone overall while being much cheaper. when are you guys will go out from that cave and see the world? That's a subjective, for example XR camera is "in your words" massively better than OP6T. You can't say some phone is overall better than other because every phone has it pros and cons and you need to figure out what you want from phone, i would never pick 6T over XR because camera is most important thing for me. why won't you buy a DSLR, or compact mirrorless then? yes, but XR isn't a better phone than 6T like it's price would suggest. Unless OT has iOS, XR is going to be a better phone for any user of iOS related software and Apple ecosystem (even 6s is going to be a better phone for them the same as for an Android related user even a Nokia 7 is going to be better than XS Max). I have DSLR, not much fun carrying that, stopped using it years ago, very happy about the progress smartphone cams have had in such a short time period. My iPhone 6 Plus had a higher resolution screen than the XR....in 2014. Please explain. FYI, your amazing super smooth latest & greatest iOS phone worth upto $1500 in US & as much as $2300 in many other countries is beaten by Xiaomi Pocophone in speed test which costs a mere $300 only. Now you can go to Antartica in frustration. The amazing, super smooth, stunning, flawless, breathtaking latest and greatest iPhone XS Max has beaten the mate 20 pro in a very famous speed test https://youtu.be/vRPxjwgqJKs Now you can go to Antartica in frustration. Not even the 256Gb XR costs 1000$, again, which phone are you talking about??? And, why picking a mediocre 1080p screen on an android phone when you can pick the best lcd screen on a phone with the iPhone? Do you have any common sense?
" Do you have any common sense?" By now you should know that they are brainwashed with paper specs, they just need guidance and we can try to help them with that. what country are you referring to? in some countries it starts from $900 from base model, do you even read what i said earlier? because phones like 6T is much cheaper and have way better screen. the sales say it all. That sheeple got triggered because someone write iPhoneXR resolution (828p) as 720p, as if it's a huge difference.. lol.. Grow up kid, there's a real smartphone with 1440p for the same price as that 828p toy. "That sheeple got triggered because someone write iPhoneXR resolution (828p) as 720p, as if it's a huge difference" it is as big difference than 828p vs 1440p OWNED! Because OLED needs it in order to have the same ppi as LCD. You do know that OLED (the one made by Samsung) has 100% green pixels and only about 70% red and blue pixels, right? alright, how about the previous iPhones? 326ppi on the small one and 400ppi on the Plus model with 1080p. Why didn't they make it 326ppi on the Plus model too if it's not much of a difference? both use LCD. Go back to math class, kid. My iPhone has a calculator...does yours? The iPhone XR in Canada is $1060 and it has a HD display (828p), when all other smartphones have full HD or Full HD+ displays. Apple overpriced the XR to begin with, especially when it doesn't have 3D touch. The other thing people are forgot to mention, is Apples service charges have are completely ludicrous nowadays. $400 USD or $600 CAD to fix the glass back of the iPhone XR. It doesn't even cost Apple that kind of money to make the entire iPhone XR in the box. Apple is a joke these days. nice that you used pocophone as an example about 1080p screen. Then it's even funnier for me to paste this video link where no-one chose that 1080p screen, NO-ONE! Watch EVERYONE pick the iPhone XR over a 1080p Screenhttps://www.youtube.com/watch?v=dcFXEXJicgc No-one said that pocophone screen look sharper, everyone just chose better looking screen which XR have by far. I think the "resolution" would have been much more appreciated if there was textual content in the test too. Videos are not a very good parameter for determining sharpness. That said the screen on XR is indeed better than the one on Poco F1 in everything apart from resolution. Another thing is that the F1 lacks widevine L1 support , so 540p on Netflix and Amazon Prime and Hulu and any other premium service (except YouTube). "Videos are not a very good parameter for determining sharpness." The funny thing is that I have seen numerous reviewers that were saying that there's no difference between the quality of XR screens and higher resolution ones except... when watching videos.